When Barbara Garcia was 23 and working to organize a free-lunch program for families living in migrant farmworker camps, she came to a realization. "I would walk through the camps and see that the people who were feeding us were going hungry, and I associated that with a lack of food security and also a danger to health," said Garcia (Oakes '84, community studies). So, five years later, when the opportunity came to help start Salud Para La Gente, a tiny health clinic for those same low-income residents in Watsonville, Garcia gave up her goal of being a teacher and jumped at the chance. Little did she know where that decision would lead. Today, Garcia oversees 20 health clinics, two hospitals, and hundreds of programs in her role as head of San Francisco's mammoth Department of Public Health. "It's a big job. It's a fun job," said Garcia, 59, who directs a department with a $2 billion budget and 8,000 employees. "Every day is incredible." Garcia grew up in a blended family of 18 children. Her father worked in the Long Beach shipyards and her mom worked in the defense industry. It was there, in the beachside city known for its port and aircraft industry, that Garcia got her first taste of community organizing. At 14, she found a job in a food pantry at a neighborhood center. "It gave me a great perspective on how to work with people in need," said Garcia, who was the first in her family to graduate from college. "The one thing I learned was how to give respect to people who were seeking basic needs." It's a lesson that has guided her life and her career. In 1989, when a 6.9-magnitude earthquake roared through Watsonville, damaging its hospital, Garcia, then director of the Salud Para La Gente clinic, threw open the facility's doors. Residents flocked to her tiny center to receive medical care, food, and clothing—10,000 people in all. 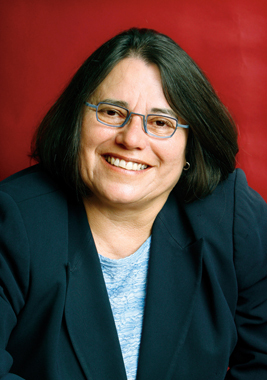 When Garcia came to San Francisco as director of homeless services, she helped start an all-day triage-like event called Homeless Connect. There, volunteers and staff linked those living on the streets to services they needed—everything from finding an apartment to getting a new pair of glasses. The program has now been modeled in 56 cities. Sitting in her office overlooking San Francisco City Hall, Garcia ran through a dizzying list of programs her department supervises: everything from restaurant inspections to running a health network that serves 120,000 patients as part of the Affordable Care Act, to providing mental health services, and managing more than 2,000 units of housing. She has lofty goals, like reducing HIV deaths and transmissions in San Francisco to zero, and sustaining a health network that will keep the two hospitals under her care strong and financially healthy. But for Garcia, it's always about the community she serves—whether it was during her years at UC Santa Cruz where she was exposed to the needs of farmworkers and low-income residents or on the streets of the city she now calls home. "One thing I tell my executives is that they can't get lost in their own power dynamics. We have to keep to the mission we are here for, and that is to improve the health of San Franciscans," Garcia said. "We really have to focus on who we are here to serve." Little known fact: During her free time, San Francisco Public Health Department Director Barbara Garcia trains and competes as a powerlifter. The 5-foot Garcia can deadlift 320 pounds.